Here I summarize the best ping pong robots out-there. Since the late 1980s, top players have been using robots to train extensively. You can bet yourself that both Ma Long and Zhang Jike use table tennis robots to warm up. They likely use the professional ping pong robot which costs $2000: The Butterfly Amicus. Your game and dedication to the game are going to improve tremendously. Because now you can hit 3000 ping pong balls in half hour and will not need to leave the house. You may still want to go to the local recreational and play but during that dead time when you’re fiddling with your phone, you can now be improving your game without a partner. I think over time this will happen to all sports training, ping pong got their first! In a pure sense, if you are serious about improving your game and end up buying and using the robot, I think you will definitely outperform someone who doesn’t get as much practice. Conversely, if you play against someone who does actively you use gameplay and robot to train you are likely going to have a poor performance versus them. Newgy is the world leader in table tennis robots. My favorite pick is Newgy Ping Pong Robot 2040. You can find it for a relatively good price on Amazon. 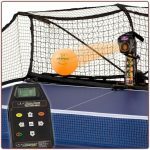 The Newgy Robo Pong 2040 table tennis machine features analog control for ball speed, along with the following shot selections available: push, chop, serve, counter, lob and fast loop. I have listed all ping-pong robots, sorted by my preference of function versus cost. For kids or recreational family fun or just want to improve your strokes, I would recommend getting the IPONG V300. For full review of each of the robot see thoughts below! The history of table tennis robots: Why are people searching for the best one? Since 1959, the Chinese players have emerged victorious 60% of the times. To ease the training procedure and improve the player’s reflexes, the table tennis robots have been introduced in the late 1980s. A table tennis robot is nothing but a machine that automatically fires table tennis balls from one end of the table in a controlled manner. The table tennis robot has 3 basic elements: a mechanism to load and fire the table tennis balls, a control box to program the firing of the balls, nets to catch the returning ball and supply of electric power. The firing mechanism will be attached or placed at one end of the table pointed towards the end at which the player is present. The supply of table tennis balls will be loaded into the firing mechanism ready for use. 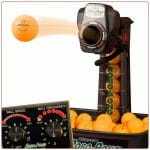 The timing of firing the balls can be controlled by making some fine adjustments in the control box. The mode of delivery can also include top spin, back spin, left side spin, right side spin or even combination of any of the previously mentioned factors. When the robot has been programmed and switched on, a steady supply of table tennis balls will be fired towards the player via the firing mechanism. This setup usually doesn’t take up much space, which is seen as a key advantage. Practicing against a robot means that you wouldn’t require another player, one can practice for as long as he pleases while working on his footwork, improve a weak stroke and most importantly it helps to improve coordination and stamina. Advancements in technologies have led to significant improvement in table tennis robots. Newgy Industries is a world leading producer of table tennis training machines. Newgy is renowned for high quality, smartly engineered that are affordable and user-friendly. Available in five models including two digital models the Robo-Pong table tennis robots fits all the standard ping pong tables and is specifically designed for easy usage. Work on automated table tennis robots started out as a hobby in 1972 by the co founder and owner of Newgy Industries Joseph E Newgarden. The idea of automated table tennis machines was seen as a method to revolutionize the way in which a person learns table tennis and practices the game. Newgy products are designed for home use games for family oriented fun. This device not only achieved this purpose successfully, it had also caused a significant increase in the interest towards the sport and from then on, its popularity increases multifold. Henceforth, Newgy Robo-Pong machine table can be cited as the sole reason why the sport of table tennis is so popular in the United States. Newgy Industries had also established Table Tennis School Programs and even a Table Tennis Training Centre located in Hendersonville, Tennessee. These developments had caused Table Tennis to become very popular and eventually, it turned out into a mainstream sport in the United States. What happened after that is now history, aided with their prominent success in the Table Tennis matches that followed thereafter. The Newgy Robo Pong 2040 table tennis machine features analog control for ball speed, along with the following shot selections available: push, chop, serve, counter, lob and fast loop. 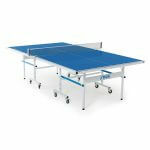 It fits all standard ping pong tables and it’s easy to set up, take down and transport. This particular table would cost about $675. This is a robot that can deliver every type of spin that exists and can place the ball into one spot or multiple spots on the table, as per the interest of the user. The remote control gives the player control over the speed and frequency of ball delivery. This machine has similar features to the Robo-Pong 1040 but has a different design and a net to recycle the balls. 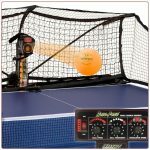 The Robo-Pong 2040 includes ball thrower with oscillation, recycling net system with side nets to capture the users return, four dozen 40mm Robo-Pong balls along with a setup DVD and training manual. Provided that your aim is good, you should be able to play with the robot forever. The Newgy Robo Pong 2040 table tennis machine works well with both celluloid 40mm balls and new plastic 40mm+ ones. The Newgy Robo-Pong 2050 table tennis machine has similar functions to the earlier mentioned Newgy Robo-Pong 540 table tennis machine and the Newgy Robo-Pong 2040 table tennis machine table. However, the 2050 machine costs around $900 on average. One user based website even rated the 2050 table an 8.4 on a 10 point scale, for its features. It’s a mount-onto table type machine. It also comes along with pre-programmable 64 drills and is also consistent with the way in which it places/serves the table tennis ball onto the table. Several users have high regard for this machine as they cite this machine to help drastically improve their game quality in a relatively shorter duration of time. Even if maintenance is required for this machine, the excellent service provided by the Newgy Industries will ensure that their customers will have their issues with their tables quickly attended to and sorted out. The Newgy Robo-Pong 540 table tennis machine also has the following shot selections: push, chop, serve, counter, lob and fast loop. It comes with a well-written instruction manual and what makes it even more popular is that it’s quite affordable, costing an average of $300. The user can adjust the head of this machine to match the opponent’s blade angle. It’s relatively easy to fix this machine if it suffers from any jams. As one user rates it as �it offers the same services as compared to the much more expensive versions while being cheaper and having a smaller number of parts, it has a lower chance of suffering from mechanical wear and tear. It is no wonder why this particular machine has gain widespread popularity over the years. The Ipong V300 is a wireless table tennis robot with the stunning structural design. Since it’s wireless, there won’t be any power adapter cables upon which the user may trip on and suffer injuries. This machine is portable and easy to carry. It has 3 main parts and is easy to set up. It can handle up to 100 balls in each loading session. A user can enjoy full control over the machine via a wireless remote controller. This particular feature has brought this machine into a league of its own. The Ipong V300 has quick rotor flexibility and is aided with the ability to place the ball quickly at different speeds and lengths. This machine comes with a tilt stand that can increase the amount of backspin on the ball and provide very specific placements. For most of the table tennis machines out there, they don’t come along with a side net. But that’s not true, in the Ipong V300 case. The machine can also be programmed so that the user is able to practice one particular stroke time and time again. Lastly, I hope you enjoyed this review of top ping pong robots and hopefully it showed up in google. In summary, there are three key ping pong robots you should consider in terms of price and user skill. 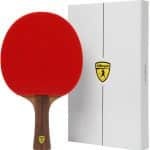 If you are a profession player, you should buy Butterfly Amicus ping pong robots. These are some top quality robots and can drastically improve your game. All professionals use these robots and you can see that the game skill for professional player has skyrocketed since advent of robots. Comparatively, for recreational player who plays competitively in a recreational league, I would highly recommend the Newgy 2040 or 2050 robots. These robots are typically half the price of professional robots and deliver almost the same functionality. In fact, I have always felt that Newgy is way more creative in robot making than other robot makers. 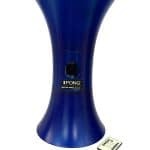 Last but not least, for the occasional player who is trying to play competitively among his peers, I would highly recommend that she/he purchase IPONG V300. This robot is very quick and fun to play with. If you use it regularly, you will definitely see your game improving and will also start having more fun because your reflexes will improve and you will start to appreciate the game. This machine comes with a tilt feature, that can improve backspin on the ball and can land in specific spots. I find this very useful personally to practice your weak shot. If you remember all your weak spots during the game, you can program your robot to give you those shots so you can get better at it. This robot also comes with a side net. This can be quite useful in setting up again and again. In summary, whether you are a professional, a town competitor or trying to one up your coworkers or friends, there is a robot for you. I hope you enjoyed reading this review. I know I enjoyed writing this review. For fun stuff, ITTF recently posted an article about how people are training with this Japanse robots. For our other reviews of table tennis equipment (ping pong balls, ping pong paddles, rubber sheets, table tennis blades), please see the relevant article titles and links below. We have also reviewed Butterfly Amicus Robot here, which is a high-end professional robot.